The authors of this book have tremendous respect for the Canada Goose. i didn't realize what would take place in the next few seconds so I didn't press the shutter when a Canada goose couple swam up toward The 86Ps. It happened very quickly. The new couple raced toward Mrs. 86P. 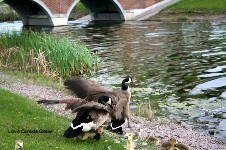 In the next few seconds, the gander attacked Mrs. 86P while his wife supported him from behind. 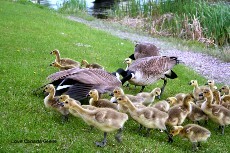 The peace was broken and in its place was a tremendous clamor of honks, hisses, snarls and frantic gosling cheeps. They fight neck to neck. Mrs. 86P isn't about to lose her brood to these robbers. She fights to keep her children amid their frenzied cheeps. Mrs. 86P is not ready to give up the fight for her babies - oh, no! 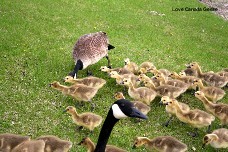 In the photo, she is growling at the robber gander and still fighting for her babies while they look on. They're too young to realize what's going on. 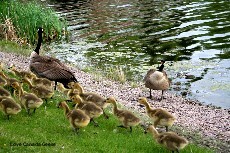 The oldest goslings in this group are 2 weeks old. They usually don't recognize their parents until they're about 4 weeks old. The robber gander turns away from Mrs. 86P. He knows he's won the fight and there's no need to continue fighting. The wife of the robber gander has called the goslings to her (see them race upward) while Mrs. 86P cries for her hubby to help her. He has been trying to keep their family intact while Mrs. 86P fought with the robber gander. 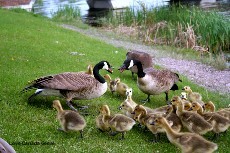 The robber gander takes over as Father Goose. 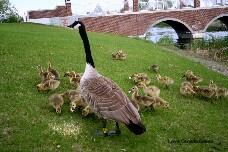 Look at the way the goslings respond to his calls and gestures. The new goose takes over as Mother Goose. 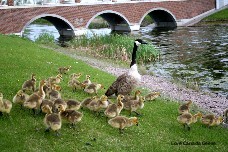 The goslings respond to her with their extended necks and cheep accordingly. They allow her to be their Mom. When 86P notices most of his goslings leaving his side and trotting off with the new parents, he joins his wife who is making a big fuss on the gravel bank, crying for him to help her, crying over the loss of her goslings. 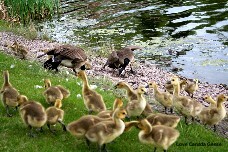 They circle the goslings, attempting to reclaim their family but the more agressive robbers drive them into the water. They swim listlessly, back and forth, Mrs. 86P honking plaintively, neck extended toward her goslings. They come back up to the gravel bank and circle the robber couple. 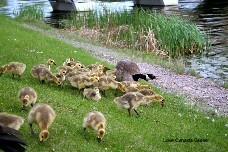 A handful of goslings run over to their side but they're unable to reclaim the rest. They've lost this round. I didn't take any photos after that last one because my camera ran out of steam! But ...I have good news to impart to you. Two days later, The 86Ps had part of their gang brood back. 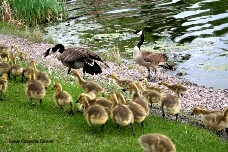 Now they're parents to about 25 goslings, including the handful who stayed with them after the fight.